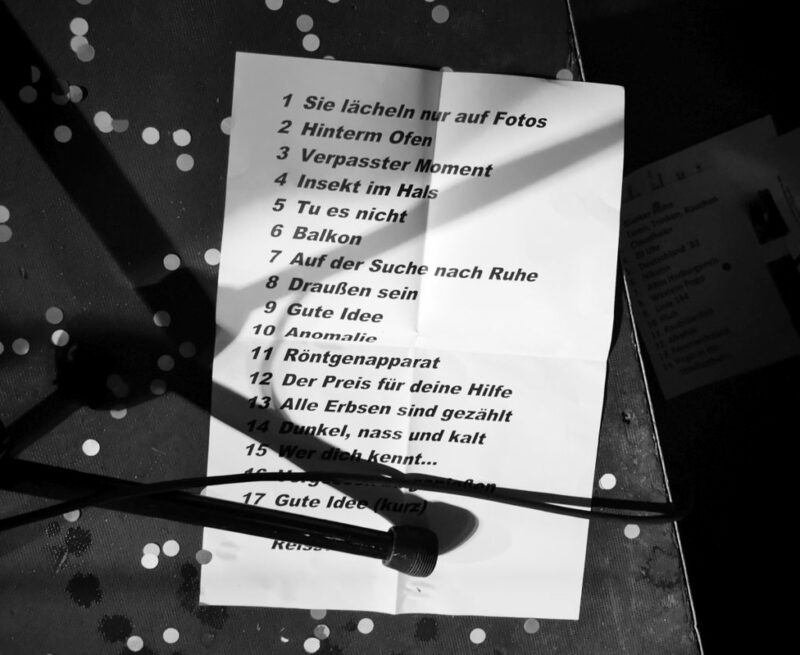 … DIY with a loudmouth title: Hamburg Punkrock throws a first! 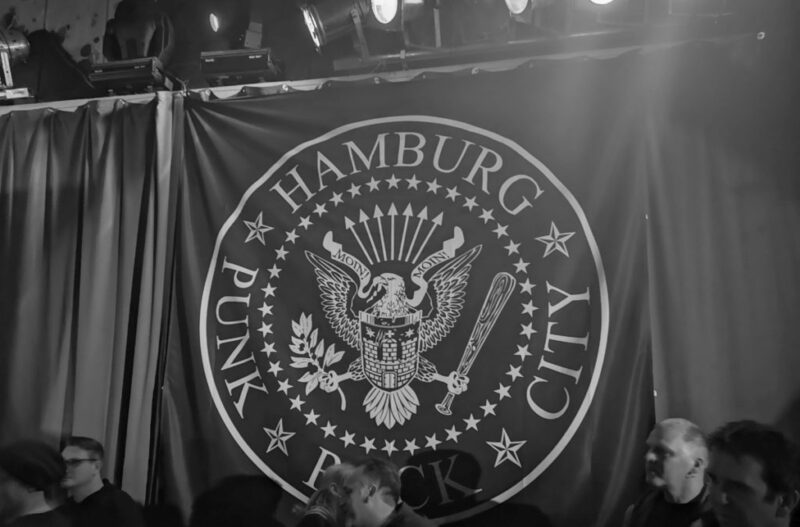 Punkrock Hamburg has been a theme for many years for the Blackpool-Pilgrims to show off force and localism at Rebellion. In the last years it also has turned into a little FB community that allows people to share, participate and promote. 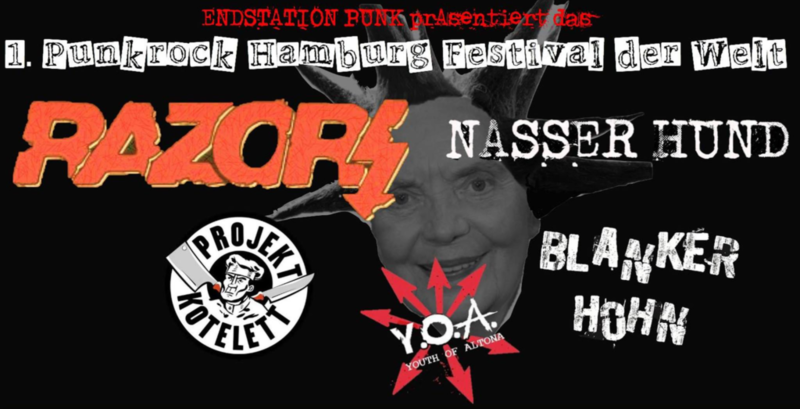 And in January 2019 it has also turned into a venture that hosts a first – the first ever Punkrock Hamburg Festival (aptly named „1st Punkrock Hamburg Festival in the world“ in a bit of a loudmouth attitude (that actually pissed off some who saw the Adverts in 1978 and where present at the first Punk shows in Hamburg)). 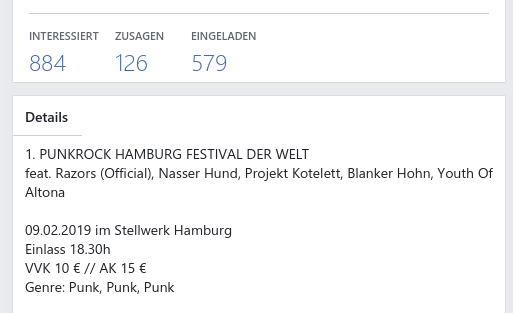 First ever Punk Rock Hamburg Festival – A sold out not a sell out! The risks of trusting the internet generation! At the ease of a finger move people are interested but in reality only few make an effort to get a ticket. Here it worked, also because it was a special location: The Stellwerk in the Harburg train station, south of the river Elbe – a rather grand room in the old station building. Kick off was early and with Youth Of Altona and they do something special: They play only ever the Wipers songs they like, not the ones the audience would like to hear. From where i stand that is a very valid setting and if that is paired with mu-sick-al capability and some form of charm than it is valuable addition to entertainment. The most daring thing though was the guitar player, who played with some form of exoskeleton as he had a broken elbow. And that on the arm that moves the fingers up and down the length of the neck. Stunning that he was able to produce a clean guitar sound (as clean as it’s shiny acrylic glass body). Great stuff but little movement on the rather small stage. But they got it right and they got the key item right: Wipers where not about speed and thus for some they played slow. I’ll say they played right. By and large they are to my ears rather painful and that is mainly because my ears never got to adjust themselves to what people refer to as Deutschpunk, specifically the class of 1984. It just does not speak to me. What i did like though was the guitar, the guy could shred out some good chords. Still, local heroes with some songs on local themes though the words today just don’t work anymore (as all of them seem grown up men, fathers and lovers). I think they would benefit from creating something new. But who am i, their marketing director? Nope, just a listener! The contrast to the next band on stage could not be bigger: Projekt Kotelett amassed 2 guitars, 2 singers, one bass and one drummer on the now really crammed stage. And they had one item that i always dig: They dressed for the occasion. All clad in some form of Deutsch and seeming to represent the unnamed Wutbürger. And with them came action, fun and loads of beer. On the musical side they blend in everything but ground themselves in fast rock (with scents of Glam, Punk and whatever). Their advantage sure is the solid back line and the two singers, who allow for some versatile back-and-forth within a song and for at least some form of aggression. And putting the danger back into Punk it at least something many (including my humble self) appreciate. They got applause and they got some dancing. And they drowned some beer. And more. An even more. 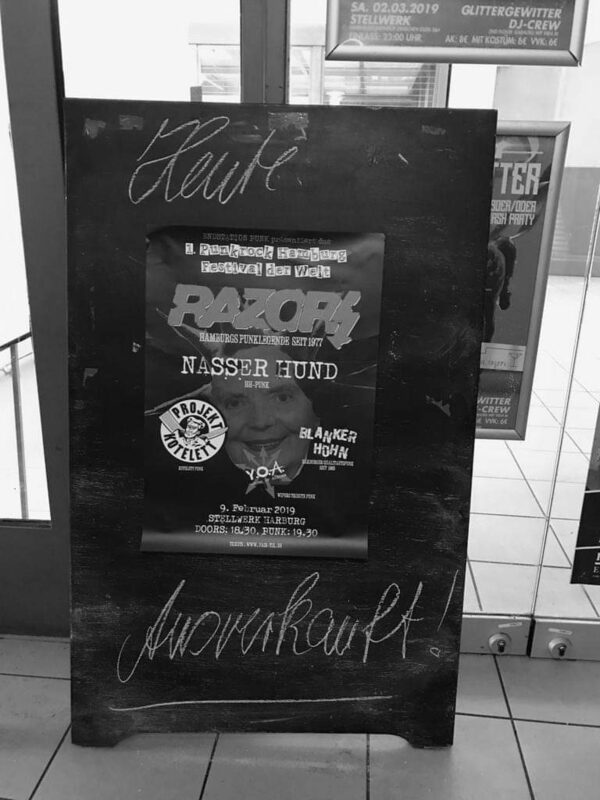 And that gave way to another stark contrast – where Projekt Kotelett where like Cabaret it was now for Nasser Hund to take the matters much more serious. As i missed their previous shows i was really keen to finally get to see – so i took at good look at the details to come. And did they meet my rather high expectation? Oh yes, they did. No frills, no fills and no nonsense down to the bone music and great, heartwarming and to-the-point German lyrics. To find a comparison is actually tricky and any comparison would actually fall back onto those who are on stage and their history in so many bands. That’s Kai on drums, Arne on bass and Jan on guitar. Whist i could brag about in how many different settings i saw them individually i have to admit that in this setting it works stunningly great. And it also works that they let speak the music and the words rather then meeting my other fetish – stage uniforms. With that i am now super eager to get the news that they finally found someone who releases their fully recorded record on vinyl. It would be a pity if that takes the fate of the yet to be released Platzangst record (which turns into a myth every year it stays unreleased). „Sie haben ihren Eltern niemals verziehen, sie lächeln nur auf Fotographien“ – absolute great line and rhyme. If they go for crowdfunding i am in. Worth the effort! Speaking of effort: Just check out the great backdrop the friendly people running this show created. It was actually funded by you and me (when buying Hamburg Punk Rock City T-Shirts from them) and we gotta be thankful to them! If you need such a shirt then seek them out on FB! There is not a lot to add to that: They pretty much enjoyed the evening (and the other bands) and they where eager to close out the evening with the same level of joy. 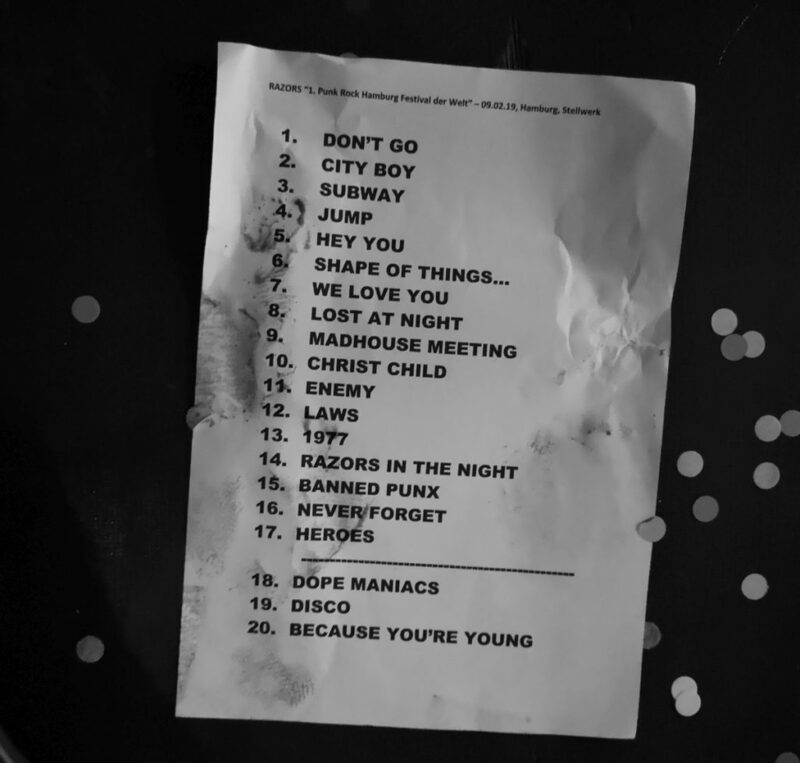 The new set list by now is in shape, mixing new songs with classics and obvious highlights like Heroes. They almost rushed through their set, had everybody smiling and dancing and delivered the solid performance you would expect. And that, after all these years, as one of us in front of the stage. 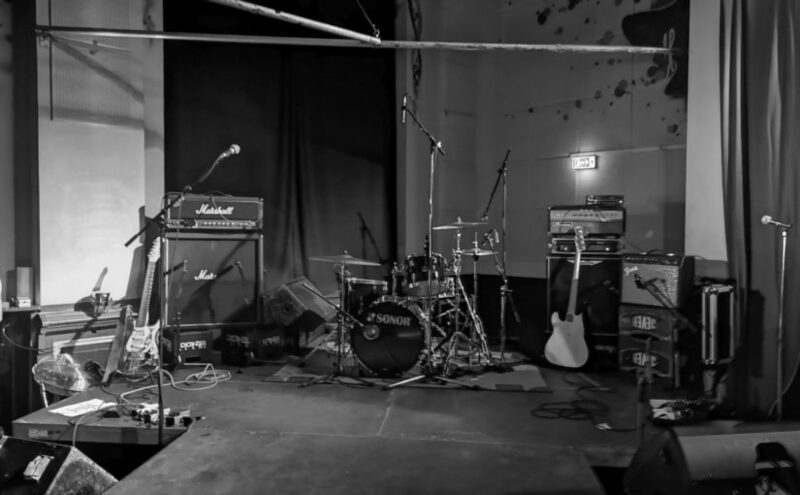 Those who read here on a permanent basis most likely know that i am somewhat biased with them, still they simply deliver towards that agenda that get’s me out to shows and see bands live. And for that i love them. Kick off at 19:30, final whistle after midnight, home in bed with a nice hangover and the best was to get the poor away game of FCSP on Friday out of me head. Mission accomplished. Mission also accomplished for the good people that put this up: Sold out, all bands got their share and nobody was hurt and nothing was destroyed. I am not sure if they are in for a replay but i will sure lobby for it. Just the name for that little festival will need to be a bit less loudmouth. Love you – you know who you are!